The big fish failed to show in the East Midland Winter League third round match on the Old Nene at Benwick on Sunday. Very few tench and bream were taken, which was a bit of a surprise in view of the mild weather leading up to the match. A string of cracking small fish weights were taken though topped by John Weedon’s 12lb 15oz from the hot pegs in A section. Runner-up was Pete Vasey, who caught all day on a squatt and pinkie approach for 11lb 2oz, then came Ian Reynolds with 10lb 6½oz. On the all-important team front Stanjay Gold brought in some of the most experienced anglers at their disposal and it paid off handsomely as they took first place on the day with 31 points. Browning Hotrods came second and the two Huntingdon-based sides top the leaderboard after three rounds with six points each. Sensas Mark One are third on eight points followed by Matrix Image on 10. The next match is scheduled for the drains in the Whittlesey and Ramsey area, with a practice match taking place this coming Sunday. The first of the Old Nene opens run through the winter months took place at the weekend. The March bypass section produced the matchwinner in the shape of Steve Slater. He topping the field with five tench and a few perch from the end peg putting 24lb 7oz to the scales. In the same section Ben Jackson was second. He fished a waggler with maggot taking a net of rudd along with a tench for 20lb 7oz. Mick Kelly took third place with 20lb 2oz. It’s not been easy fishing over the past week at most of our local commercial waters. The weather has been very kind to us, but I am sure the carp seem to know that winter is not too far away now and weights at times have reflected that. However, the leading weights have held up well. In the Decoy Lakes Friday Over 55s match on the Oak Pool, Roy Whincup put a very respectable 140lb 15oz to the scales. He fished a small maggot feeder on peg 26 and caught carp to 8lb regularly all day. Not too far off the pace was Vince Hull. His corn and pellet approach saw him finish on 137lb 13oz, then came Dave Thornton with 119lb 14oz. The Saturday open matches at Float Fish Farm continue to attract a strong field to the Two Island Pool, which saw weights holding up well at the weekend. 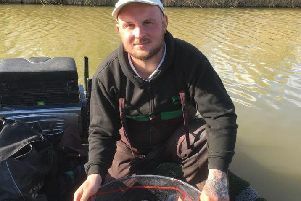 Andy Adams won fishing the long pole with maggot over micro pellets for 116lb. Runner-up was Stan Dow, he caught close in on the pole, putting 85lb to the scales, then came Rob Goodson on 45lb 8oz. There was another good turnout for the Webb’s AC match fished at Kingsland Fishery. Some anglers found it tough going but matchwinner Mick Linnell caught steadily all day on a small feeder and pellet to finish with 68lb 12oz. Vince Hull fished corn and pellet to finish second with 54lb 9oz, then came Gordon Harmer with 53lb 9oz.